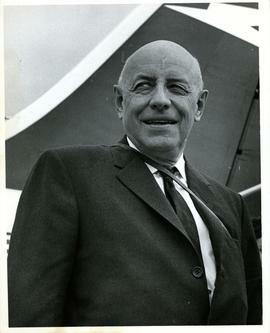 Henry F. Hall was the fourth principal of Sir George Williams University (1957-1962), dean (1936-1956) and student counsellor, and full-time faculty member in the Natural Sciences Division (1934-1967). Over the course of Hall’s forty-year career he helped direct the transition of Sir George Williams College into a credited university, developed the guidance program, and encouraged curriculum development, increased course offerings, and student and faculty growth. Hall’s approach to teaching and administration was influenced by the ethos of the Young Men’s Christian Association (YMCA) and the social impact of World War I and II, and his leadership shaped by his relationships with co-administrators and former principals Kenneth E. Norris and Douglass B. Clarke. He is also the author of “The Georgian Spirit: The Story of Sir George Williams University,” published in 1966. Hall died September 4, 1971 at his home in Montreal, Quebec. Hall was born June 18, 1897 in Farnham, Brome County, in the Quebec Eastern Townships to Frederick Rupert Hall and Guelielma (Ella) Foss both of Cowansville, Quebec. He attended secondary school at Cowansville Academy. In 1916, Hall enlisted in the Canadian army and served overseas from 1916 to 1918 with the 42nd Battalion, Royal Highlanders of Canada. Before the end of World War I he began working with the recreational facilities for servicemen program sponsored by the YMCA in 1918 at the Bramshott Demobilization Centre, a Canadian military training base in Hampshire, England. Due to his involvement with the YMCA overseas, upon his return to Quebec in the summer of 1919, Hall was offered the position Boys’ Work Secretary in the Sherbrooke Association of the YMCA in Sherbrooke, Quebec. In 1920, Hall moved to Montreal, Quebec where he enrolled at the Montreal Diocesan Theological College (an affiliate college of McGill University) and was granted his Licentiate of Religious Education in 1924. With this training, Hall was appointed Boys’ Work Secretary for the Central Branch of the Montreal YMCA that same year. 1924 was also marked by Hall’s marriage to his fiancée, Anna Eliza Thompson, in October. The couples’ eldest son, Radway, was born in 1925, followed by Frederick and John by 1929. Thanks to his experience and training with the YMCA in 1926 Hall was appointed Student Counsellor at Sir George Williams College (formerly called the Montreal YMCA Schools) located in downtown Montreal. Hall’s new position was the first of its kind in Canada. In 1934, Hall joined the College faculty as a Professor in the Natural Sciences Division. Alongside his guidance duties, he began teaching Natural Science 101 (General Course in the Natural Sciences), Biology 102 (Genetics and Human Welfare), Psychology 103 (Educational and Vocational Guidance), Religious Education 101 (Principles of Religious Education) and Religious Education 102 (Curriculum and Practice in Religious Education). True to the Colleges’ the principles of accessible and continuing education for adults, these courses were offered in the evening and during the day. Hall’s own education remained a priority throughout the 1920s and 1930s. He completed summer courses in 1927 at the Graduate School of Education at Harvard University in Cambridge, Massachusetts and additional courses at Eastern University in Philadelphia, Pennsylvania. In 1935, Hall was promoted to dean. This position expanded Hall’s guidance functions and would define his career as he would continue to be affectionately known as ‘Dean Hall,’ or simply ‘Dean,’ even after he stepped down and began his tenure as principal in 1957. In the 1940s and 1950s, Hall’s teaching responsibilities grew to include the courses Education 104 (Curriculum and Practice in Religious Education), Education 103 (Principles of Religious Education), Sociology 108b (Administration of the YMCA and similar agencies), Sociology 108 (Applied Sociology), and Sociology 108c (History, Philosophy and Organization of the YMCA, later titled Applied Sociology 211). In addition to his work at Sir George Williams, Hall sat on the committee of the YMCA of Montreal, the executive committee of the National Council of YMCAs of Canada, and the International Committee of YMCAs. He served terms as president of the Royal Astronomical Society of Canada, University Counselling and Placement Services, and the Montreal Council of Social Agencies, and sat on the board of directors of the Montreal Council of Social Agencies and the Montreal Diocesan Theological College. Hall was also an active member of the National Geographic Society, the Kiwanis Club of Sir George, and St. Philips Anglican Church in Montreal West. Hall retired as principal in 1962 and from teaching in 1966, at which point he also stepped down from his administrative duties as member of the University Council and Board of Governors. He remained involved at Sir George as Principal Emeritus and Governor Emeritus. To honour his long administrative and teaching career, the new university building located on de Maisonneuve Boulevard (formerly Burnside Street) opened in 1966 was named the Henry F. Hall Building. In recognition of his term as principal, the Henry F. Hall Scholarship Fund was established in 1962 and Hall was awarded the Sir George Williams University Long Service Award in 1963. Hall was also celebrated within the educational community: he was granted honourary Doctor of Laws degrees from McMaster University in Hamilton, Ontario (1956), McGill University (1962), and Sir George Williams University (1966), and an honourary Doctor of Divinity degree from the Montreal Diocesan Theological College (1960). Hall’s commitment to the YMCA was recognized with an honourary membership and lifetime contribution award granted by the National Council of YMCAs. In 1967, Hall was one of the first recipients of the Centennial Medal and Order of Canada. The fonds is reflective of Hall’s forty-year career as a counselor, instructor, and administrator at Sir George Williams University in Montreal, Quebec and leader in the field of Canadian education. Materials in this fonds also highlight Hall’s life-long work with the Young Men’s Christian Association (YMCA) of Montreal, his commitment to the growth of Sir George, his role as a respected public figure, his participation in the scientific and religious communities of Montreal, and his diverse personal interests including astronomy, biology, and the history of the Eastern Townships. The fonds primarily consists of Hall’s teaching notes and course outlines, research, correspondence, his drafts of "The Georgian Spirit: The Story of Sir George Williams University," typed addresses and presentation notes, and conference materials, as well as personal documents such as notebooks, educational records, and gifts. Also included are awards, diplomas and certificates, photographic material, memorabilia, and materials collected and used by Hall such as reports, publications, manuscripts, and press clippings. Some items were water damaged following a fire in the archives in 1982. Affected notebooks and publications are cockled, suffered information loss, or may be fragile or difficult to handle. Older documents and some publications are fragile and should be handled with care. See box listing condition reports. The majority of the documents in this fonds were donated to the archives in 1975 by Henry F. Hall’s son, John L. Hall, Director of the Personnel Department of Concordia University, with accruals made between 1975 and 1992. Other items and files were accessioned into the fonds via transfer to the archives by departments within Concordia University. Departments and dates of accession are as follows: Office of the Rector (1974), John L. Hall via the Human Resources Department (1981), the Biology Department (1996), Webster Library Special Collections (1999), and Webster Library (2004, 2006). The custodial history of these items and files prior to their acquisition by the transferring departments is unknown. Some basic processing of this fonds had been completed shortly after donation and after each subsequent accrual. In 2015, a series-level arrangement was imposed by the archivist according to Hall's functions as an educator and administrator and according to document type. Within each series items are arranged loosely chronologically, and by activity or document type. Items related to similar activities or events were re-filed together and some items were transferred or removed during appraisal. I0006-11-0178 - Interview with Henry F. Hall [sound recording]. - 1969. - 5 audio reels (1 hr. 59 min. 22 sec.). Interview with Dr. Henry F. Hall in which he recorded his early life and some personal memories, conducted by his daughter-in-law, Mary Elizabeth Hall.